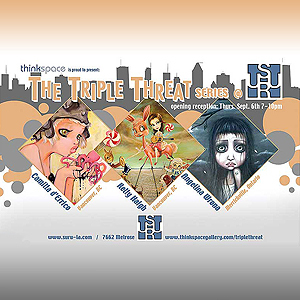 Thinkspace and SURU present The Triple Threat Series featuring new works from Camilla d’Errico (Vancouver, BC) www.camilladerrico.com Kelly Haigh (Vancouver, BC) www.dollinthefamily.com Angelina Wrona (Merrickville, ON) www.angelinawrona.ca SURU 7662 Melrose Ave. Los Angeles, CA 90046 #323.655.0770 Thinkspace Gallery and SURU present The Triple Threat Series. This special exhibition series helps to further expose many of the emerging artists that Thinkspace Gallery works with and, in turn, exposes them to a new audience that might not otherwise venture into a standard art gallery. The relationship between the two tastemakers began in the spring of 2006 with a special show for Hawaiian artist Ekundayo, of whom Joe Hahn (SURU co-owner / Linkin Park DJ) is a big supporter and collector. After that initial success, much discussion and brainstorming followed on how the two could work more closely together, further fusing the worlds of art and pop culture in the process. Debuting this past May, The Triple Threat Series spotlights three emerging artists every other month. In conjunction with the openings, SURU will produce a series of limited edition t-shirts designed by and/or featuring artwork from that month’s featured artists. Each exhibit will stay up for two months and will be kicked off with an opening night reception complete with open bar and DJ, all taking place in the middle of Melrose, one of the world’s major epicenters for popular culture.